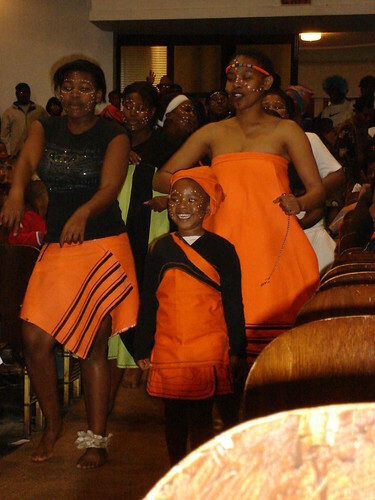 The 24th of September is Heritage Day in South Africa. It celebrates the diversity and heritage of all South Africans. It is also known as National Braai (BBQ) day and people are encouraged to have braais with their family and friends. For the past two years we have, in fact, partaken of braais on this day (long time readers may remember the whole sheep on a spit…) but this year the weather has been so wet and cold that no one in our circle of friends bothered. 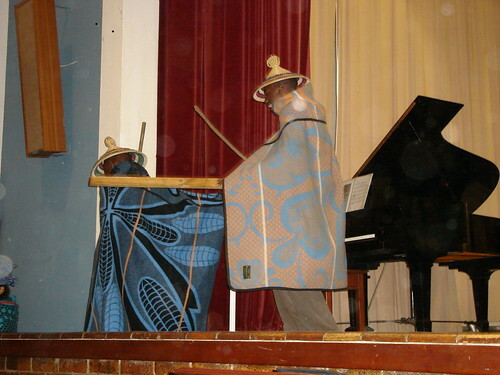 I was part of the college’s Heritage Day celebrations as the college choir sang in English and in Xhosa. The Xhosa songs brought the house down. At one stage the audience was cheering so loudly we couldn’t hear ourselves singing. The celebrations started off with a parade of all of the nations represented on the campus. They missed a few (the Aussies, the Swiss, and the Italians) but the UK and the USA flags were carried in by their countrymen. The highlight of the celebrations for me was the traditional dances. I took about 100 photos (a lot of which didn’t turn out because catching people dancing at a distance with a point and shoot is kind of tricky), but I thought you might like to see some of the best ones. 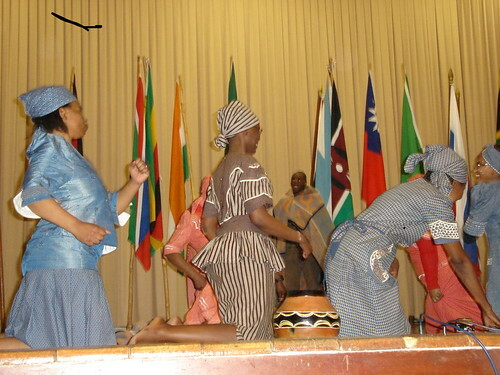 After the Xhosa dancers it was the turn of the dancers from Lesotho (say le sue two). This is one part of Africa I really want to visit before we leave. Lesotho is a small country completely surrounded by South Africa and is extremely mountainous. It is cold there, it snows in winter, and the national costume reflects that. With out the blankets the ladies clothes are reflective of a European influence. This was part of the dance. 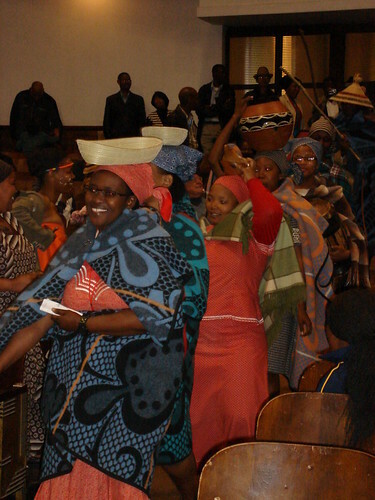 I love the Sotho (if you are from Lesotho you are called Sotho (say Sue two) men’s hats. These guys had some really wild fighting displays with the sticks, but unfortunately all of those shots turned out blurry as they were too fast for my camera to handle. 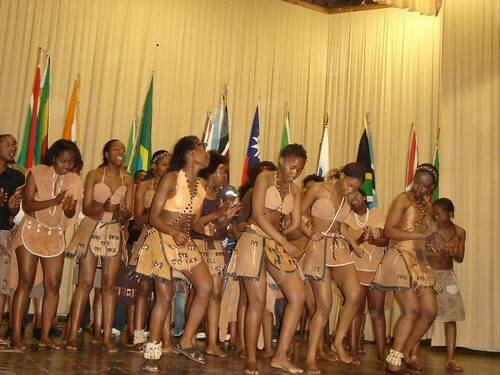 The biggest team of dancers came from Botswana. Wednesday was cold. I was wearing jeans, hand knit socks, turtle neck jumper and a coat. Botswana is considerably warmer than South Africa, and their national costume reflects this. Hope you enjoyed your glimpses of Heritage day. 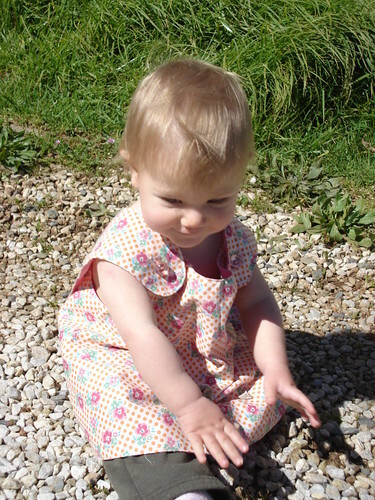 In crafting news: Gorgeous Girl has another new dress, same pattern as before, in blue this time. Pictures when it has buttons. I made a new skirt, drafted the pattern myself from an online tutorial. Maths was never my strong poing, the angle of the skirt is a bit odd. I’m not sure if it’s quirky or just really ugly. Gorgeous Man leans towards really ugly, and I trust his advice. So I’m thinking this is going to be an around the house skirt. Once it’s washed I’ll take a picture for you. 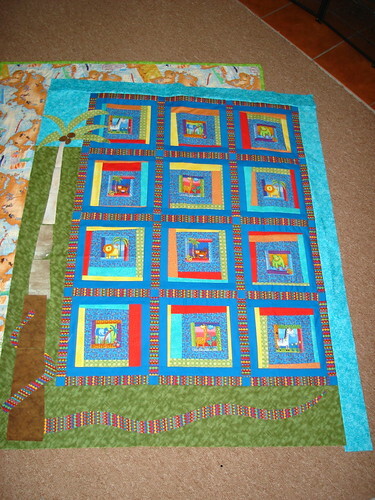 So this is the current quilt in progress. When I emailed them with my concerns I didn’t receive any response at all. 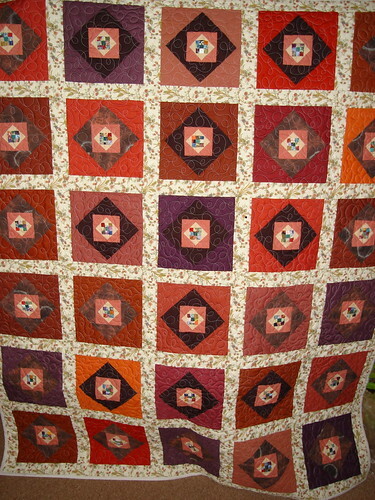 Oh, and I discovered on the weekend, that despite the claims made on the pattern, not all of the pieces were reversed! So I had to redraft the snake around the tree. Good thing I have a husband who knows all about snakes, and could advise on how the coils should look. 🙂 they look much better after his input. Ok, I need your opinion. The snake is meant to be hidden by grass – which according to the pattern I’m supposed to draft myself (that was another rude shock). I can’t draw at all. I tried drafting grass and it’s not good. Do you think the snake looks ok out there on it’s own? Please be honest. If you all think it needs grass I’ll have another go. I managed to finish the dress. 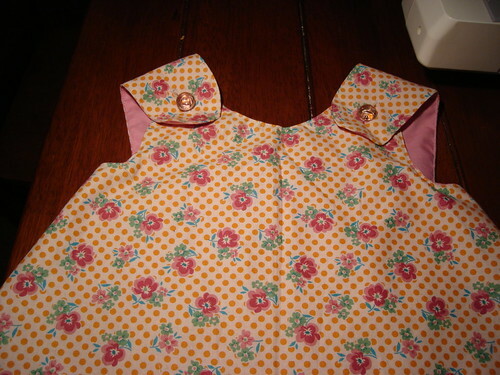 The button holes aren’t great, but they are functional. When my friend Simone migrated to Northern Ireland recently, she gifted me with her pile of Your Family magazines (a South African publication) and the last three months of her subscription. The pattern for the dress was in one of them. I modified the pattern by omitting the ricrack (since I didn’t have any that matched) and top stitched around the edge for that more professional look. The bad news is that it’s still too cold for Gorgeous Girl to wear it, and it’s still a little large (it was for her age group, but she is petite). However, it is sunny today, so we did head outside quickly for a quick photo shoot before getting back into a long sleeve shirt again. Gorgeous Girl is sleeping through the night now on a very regular basis, and I’m feeling like I’m finally getting over the flu, so I have more energy and there is actually crafting happening. I’ve got a pair of socks nearly finished. So, with the upcoming trip in mind, we have had to start weaning Gorgeous Girl. That is going better than any of us expected. But have you seen what’s in formula!!! She’s on a soy formula, and the main ingredient is corn syrup. This is not a long term thing for us, so I’m expressing, and will express while I’m away and hopefully we’ll go back to regular nursing when I come home. Please don’t leave me hate messages if you fed/feed your kids on formula, I totally respect people who need to do that or have no choice. For us, I have heaps of milk, and I hate sterilising bottles, so nursing is easiest. Still haven’t found a car, you really forget how vital one is until you are without it! I have finally cut out all of the pieces to applique onto Gorgeous Girl’s quilt, I can only lay it out on the floor to pin down while she’s napping, and since she’s just gone down I’m going to take advantage of that. Hopefully some work in progress pictures in the next post. We are still not quite sure how the car accident happened, as the angle of the damage is very odd. Any CSIs out there? 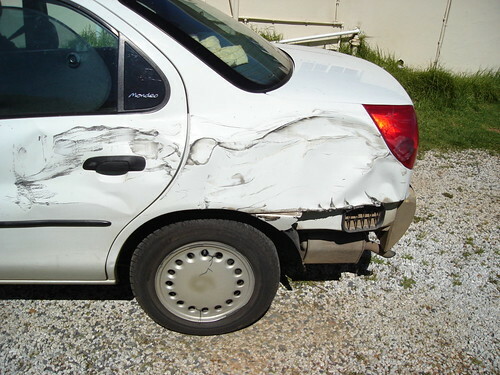 This damage was enough that the insurance company wrote off the car (too expensive to repair apparently). 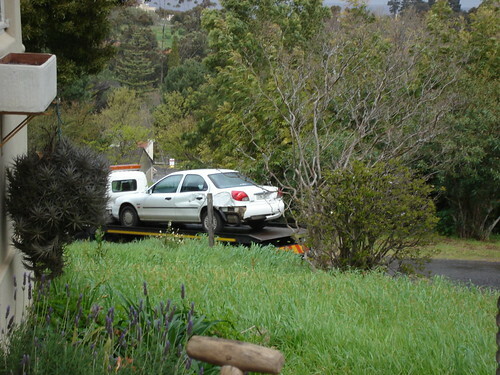 The tow truck came and got it yesterday. Here it is on the backof the truck ready to leave. Our last glimpse of the car. I’m so sad to be seeing this car going. I really didn’t mind driving it. When I did the test drive it felt instantly comfortable. We are looking for a different car now. Sigh. It’s kind of hard to find something reliable in our price-range, that we are both happy driving. I’ll try and post photos tomorrow. 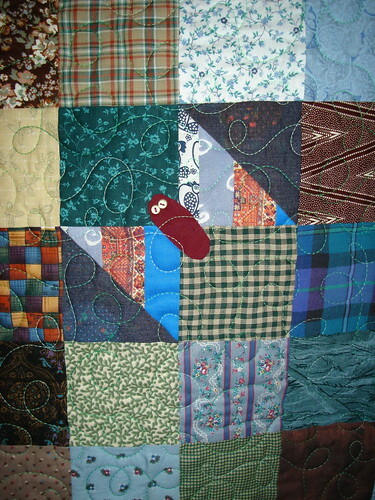 I couldn’t stay the whole day as I had to go test-driving and return the car to the insurer, but I’m confident that there will be lots of quilts finished. Shame I won’t be seeing them since I’m not going back to the guild this year. You know how they say “It never rains, but it pours” well that saying was true of last week, both literally and figuratively. 1. 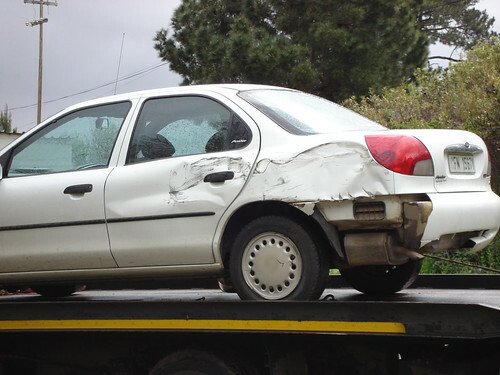 A low speed altercation with a dump truck that has resulted in the car being written off. I will have pictures of the damage once it stops raining long enough to get outside with a camera. 2. The whole family coming down with an incredibly bad cold, including Gorgeous Girl, so we have been housebound. Today was Gorgeous Man’s birthday, apart from going down to the mall to get his passport photos taken we’ve been feeling too urgh to do anything else. Gorgeous Girl is demonstrating a marked improvement in sleeping through the night. She’s done it 3 times this week. Last night she woke up at 1, but only murmured and then put herself back to sleep. 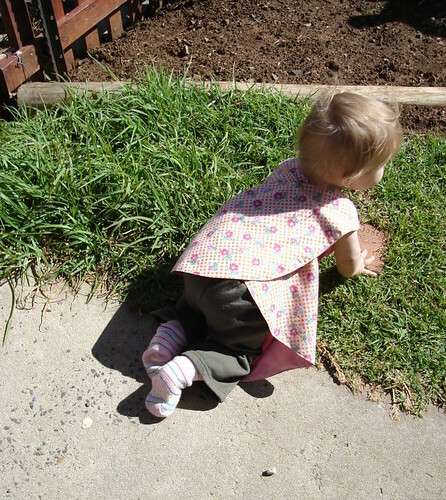 I’ve started sewing a dress for Gorgeous Girl. 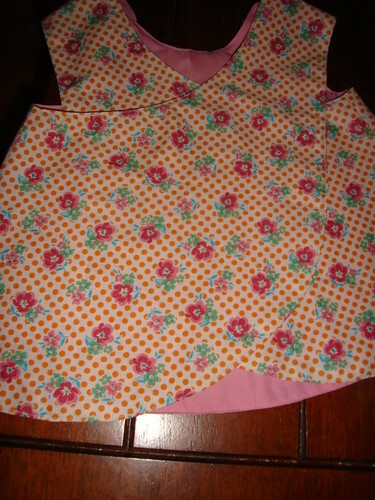 My first attempt at sewing clothes. 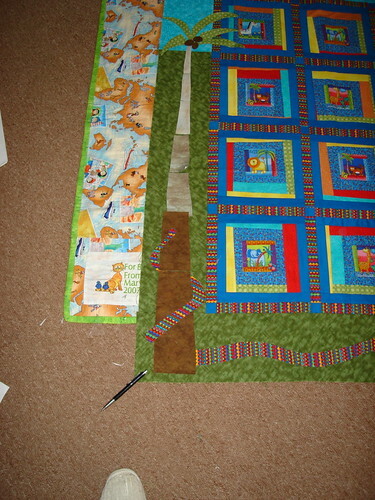 So far the cutting out of the pieces has gone well, and I can see how they should fit together. Now just to find the time (and energy) to sew it all up. I’m very far behind in my email and blog reading. Thank you all for continuing to visit despite my sporadic postings of late. This week can only be better right? I should begin by clearing up what seems to be a misconception from my previous post. I didn’t mean to imply that South Africans who “have” don’t donate or do charity work. They do a tremendous amount, it’s just that the need here is so great that it’s overwhelming and charity on it’s own isn’t going to fix the problem. 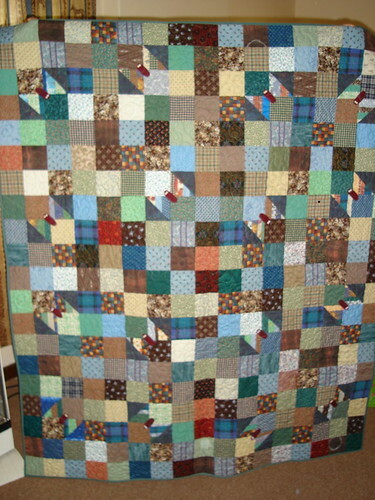 You may remember that I suggested the guild have a quiltathon and donate the resulting quilts to charity. 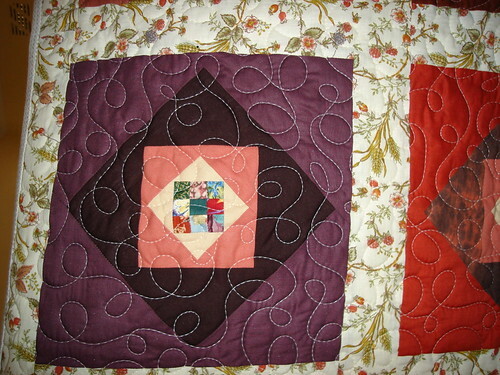 Well, that is happening on the 15th of September, but my friend F has already finished 5 quilts. Due to the on-going guild drama she won’t be there and this is her contribution. 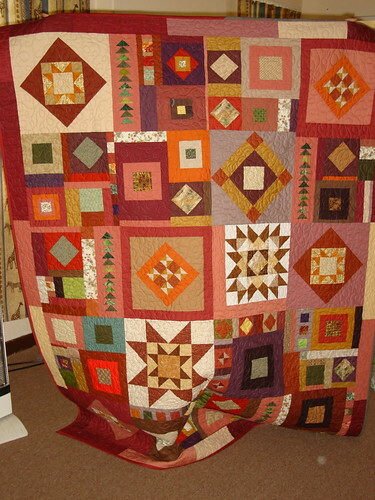 I thought you might like to see the quilts. The diamonds are mini-log cabins set on point (centre square was cut one inch). 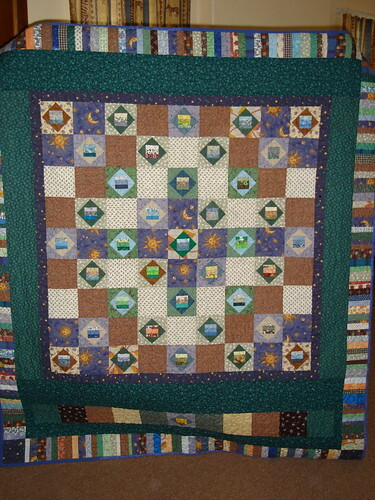 The centres are 9 patches made up of 1 inch squares! 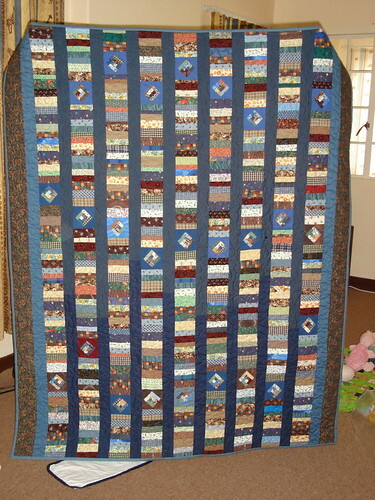 This last quilt was made out of donated blocks that F fitted together. Really don’t want to go on and on about it, but I went to my last guild meeting yesterday. The attitude of the remaining committee members, and they way they treated me after the meeting when the other ladies had gone home, really just confirmed in my mind that my resignation from the committee was totally the right move to make!